Tarsiers are little primates about the size of my fist, with large, bulging eyes and tiny, long-fingered hands, who sleep all day long and hunt for insects at night. They are native to the forests of Bohol, and are protected here so that you can pay 50 pesos to walk through the little tarsier sanctuary and watch them sleep or eye you suspiciously from under small wooden houses hanging from the trees. They look incredibly fragile, as if they could break if you even thought of holding one in your hand. So you try not to think about it, but it’s hard. They are so adorable. Rowan wasn’t that interested in looking at them, but he did enjoy taking photos of them with his Lego camera. I think he was very proud to walk around with it slung around his neck with a bright blue string, snapping away with happy abandon. After our short tour, our driver took us to see some giant anacondas in a small wood and wire zoo along the side of the road. Rowan even lay down along side the enormous snakes, petting and picking at their skin with his fingers. 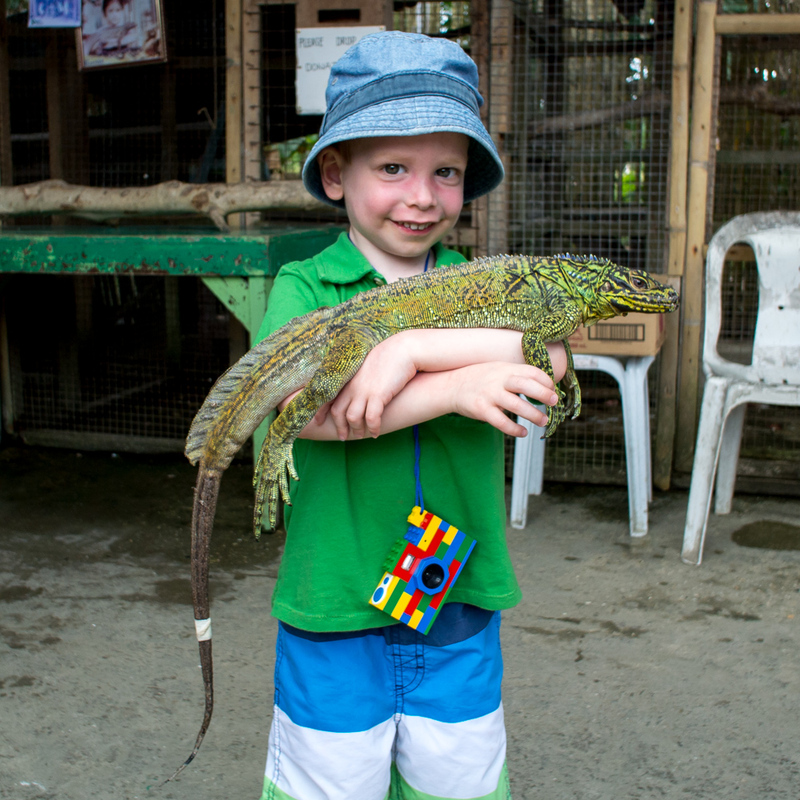 Then he held a large lizard in his hands and posed happily for photos, while the tourists around us laughed at his big and fearless lizard hug. We made it back at our resort in time for a quick lunch before I headed for a massage on the beach. The hot, sand-speckled breeze billowed over my skin as I watched tiny hermit crabs track their way over Mount Everests of sand below my comfy massage table. The sound of high waves hitting the shore in the distance made me want to sleep, except I needed to find out if the hermit crab Mallorys made their summits or not. So I stayed awake, focusing on the amazing stretches that were coaxing the stiffness from my muscles, the aches in my lower back from carrying a tired three-year-old through airports, restaurants and hotel lobbies disappearing with each moment of beach massage heaven.